A Luau (Hawaiian: lūʻau, pronounced as “LOO-ow”) is a traditional Hawaiian party usually including food and entertainment. For most visitors to the Big Island, going to a Luau means joining many other tourists at a Luau experience including a buffet with food traditionally served at such events, accompanied by cultural performances from Hawaii and greater Polynesia show including music, dance, and stories. A Luau show is a fun way to spend your evening but is probably not liked by everyone. It is also by no means the only way to experience Hawaiian culture. Should you visit a Luau? The history of the Luau traces back to the year 1819 when King Kamehameha II removed the religious law mandating that men and women ate their meals separately. Soon after, the king performed the symbolic act of eating together with women thus holding arguably the first Luau. This means that the Luau as we know it today was created almost 200 years ago and as such represents part of Hawaiian history. If you are interested in the history of the Luau, you can read more about it here. Should you go to a Luau? Many people think that visiting a Luau while vacationing in Hawaii is a “must-do” event. This is by no means true. A luau is a memorable and fun dinner show with local food and island entertainment. They are often held in a gorgeous setting and if you like a good show you will make good memories. You should definitely have a look at our favorite Luau shows if this description sounds good to you! However, there are certain things you should know (expect) when signing up for a Luau show. For example, you will be attending a luau together with possibly hundreds of other tourists and also may share a large table with strangers. Another thing to consider is the price. A Luau is not cheap (ballpark $100/person), and, although the food you are served is in general good, you will be able to find better food for a lower price at local restaurants. If your main reason to visit a Luau is to get to know Hawaiian culture, you may be better off at one of the free Hula shows or other cultural events organized all over the Big Island. See our list of cultural events below to see if there is something that fits your itinerary. Luau Dinner Show impression from Maui. The number of people present at such shows varies. Image credit: Joe Parks under a CC-2.0 license. 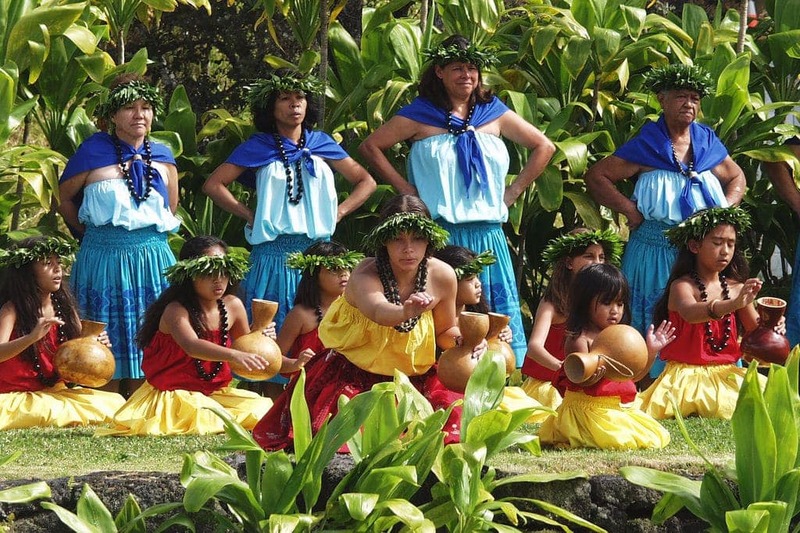 Most Luau shows are organized by the resorts on the Kohala coast and in Kona on the west coast of the Big Island. The list below contains the most popular Luau choices on the Big Island. 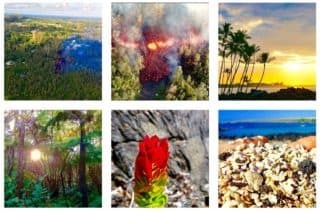 For a comparison between most of the Luaus on the Big Island you can have a look at the activity aggregator website hawaiiactivities1. Sunset Luau at the Waikoloa Beach Marriott Resort & Spa [link] or phone: 808-886-8111. Hula is a form of dance that is accompanies by a chant or song. Hula was first developed here on the Hawaiian islands and is a way of story telling: hula dancers portray the words being sung/chanted with a complex hand motions and a graceful dance motions. In pre-western-contact Hawaii written language did not exist and hula played an important role in keeping history, genealogy, mythology, and culture, alive. Dancing hula was a way to express culture and has an important place in society. Nowadays hula has become a worldwide symbol for Hawaii culture, and visitors can enjoy Hula performances while they are visiting our Hawaiian islands. In the following video you can see Kaumakaiwa Kanakaole express the true meaning of hula from a native Hawaiian perspective. Kanakaole is a force of nature: she has won multiple Na Hoku Hanohano Awards (Hawaii’s highest musical honor), and has traveled the world performing. Modern Hula can be split in two different types: Hula Kahiko and Hula Auana. Hula Kahiko is the traditional or ancient style and is often defined as those hula composed prior to 1894. Hula kahiko is performed today by dancing to the historical chants without the use of modern instruments and is characterized by traditional costuming, an austere look, and a reverence for their spiritual root. Hula Kahiko is what people refer to when they speak about “traditional hula”. Hula Auana is a more contemporary form of Hula, where the old histories have been re-imagined with new choreography and music, including more modern instruments such as the ukulele, guitar, steel guitar, bass or piano. Some of the national parks and shopping centers on the Big Island organize free cultural events. Most of these events are organized on a weekly or monthly basis, so it is very likely you will be able to attend one during your visit to the Big Island. These events include e.g. Polynesian shows, Hula performances, music shows and Hawaiian craft demonstrations such as lei making classes and Hawaiian featherwork. Hula kahiko performance at the pā hula in Hawaii Volcanoes National Park. Image credit: Ron Ardis under a CC-2.0 license.